Jake Madden ’19, president-elect of the Associated Students of the University of Redlands, has a clear vision of his priorities for his term in office. The Bulldog Blog caught up recently with Jake Madden ’19, president-elect of the Associated Students of the University of Redlands (ASUR) for the 2018-19 academic year. 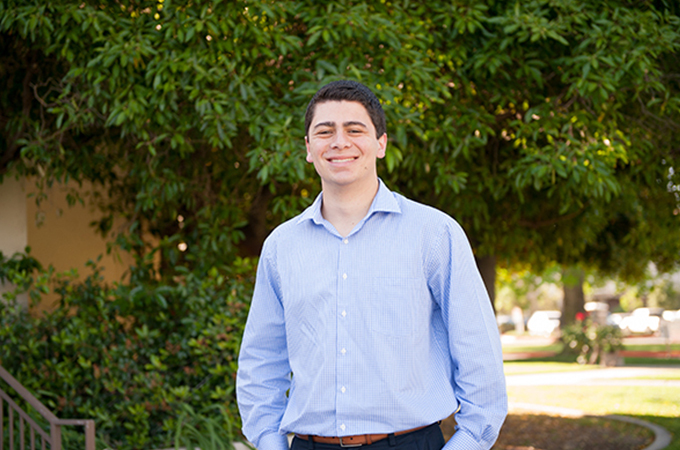 An economics and public policy major from Yucaipa, Calif., Madden builds on his three-year tenure in student government. Members of the Bulldog Blog team chatted with Madden about the changes he has already made within ASUR and his vision for next year. Bulldog Blog: What are your ideas for the direction of ASUR in the coming year? Jake Madden: I want to make ASUR much more efficient. So far, that’s been done with a huge restructuring. The cabinet is much smaller than previous years. ASUR’s new vice president is Liran Koropitzer ’19; the senate chair is Ally Thorson ’19; the judicial chair is Lidya Stamper ’19; the director of finance is Robert Brito ’19; the director of social affairs is Faith Pejsa ’19; and the director of communications is Tiffani Moorehead ‘19. Convocations and Lectures is now under the vice president. Also, I want ASUR to be more transparent—I want people on campus to actually know what we’re doing. Right now, I’m just getting everything set up for next year and making sure everyone has what they need. Almost everyone on staff has prior experience on ASUR, so they already know how things work. We’re all seniors. BB: Is that abnormal? That you’re all seniors? JM: Yes. Typically, cabinets will have sophomores or juniors, but this year it’s all seniors. BB: What else is going to be different about ASUR with your presidency? JM: I wanted to change the ASUR constitution because it used to be 53 pages long, including bylaws. As president-elect, I was able to get 12 pages taken out of that document. Senate also underwent a huge reorganization. Senators used to be elected in the fall, but now they’re elected in the spring so they’re ready to go for the next school year. Senators now also chosen by class instead of residence hall. It was really hard to get one senator per hall, so with three senators per class the election process is a lot easier. First-year students still elect senators in the fall, once they first arrive on campus. BB: Are there things that you personally care about and want to change? JM: Definitely. One of my projects is to give reusable water bottles to students during New Student Orientation. I was an orientation leader and there are actually people designated to go drive water bottles around everywhere. I want ASUR to pay to give students water bottles of good quality. Along with that, I would like to see more sustainable practices like additional water stations and looking at how we might reduce plastic use in the Commons. That’s a huge student concern that’s always addressed but never really resolved. I’m also focusing on student wellbeing. We should have programming that extends beyond finals week to help students de-stress and get the support they need. Normally, there’s always a waitlist for the counselors, but we’re trying to eliminate the waitlist. ASUR has already created a committee to allocate funds towards hiring a part-time counselor for the next year, part of a five-year term. BB: As a public policy and economics major, what are you hoping to do after you graduate? JM: I want to go to law school and potentially study corporate litigation and get into politics in the long run. It has been a process figuring that out—I used to want to be a doctor, and then that changed to business, and then I got interested in economics and politics. College has been a big filter for me. I’m happy with the way it has worked out. Learn more about the Associated Students of the University of Redlands.